Ideally, a piano should be tuned every time you play it, but practically speaking, you should tune a home-use piano at least once annually, and preferably every six months. Church, school and institutional-use pianos should be tuned every three to four months, or after 500 hours of use. Over time, fluctuations in humidity and temperature change a piano’s string tension unpredictably and cause the piano to lose its pitch. 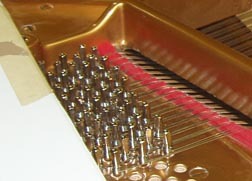 High humidity causes the piano’s tuning pin block to swell, which makes the piano very sharp. Low humidity has the opposite effect, causing the piano to become flat. 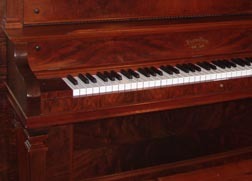 Other conditions, like heavy use or movement of the piano can also cause the piano to lose its tuning. Upright pianos are particularly susceptible to movement-related tuning issues, because the soundboard flexes when an upright piano is moved. Grand pianos also tend to lose pitch when moved. If you must move your piano, wait two to three weeks after the move, and then have the piano retuned. “Concert pitch,” established in 1926 as a standard, set the A above middle C to 440MHZ. The Stuttgart Conference recommended the 440MHZ (C264) concert pitch as early as 1834, so this is also known as the “Stuttgart” pitch. Today, most instruments are designed for the 440MHZ pitch, but a few symphonies preferred to work in 442mhz. I have tuned some German-made pianos to 442MHZ. When should a piano be voiced? Voicing is piano is not the same as tuning a piano, but is often done in conjunction with a tuning. When a piano is voiced, the hammer felts are manipulated to provide a different tonal quality, such a dark rich tone or a bright tone. As a rule of thumb, pianos should be voiced whenever there is noticeable change in quality of tone of the piano. Why do I have rust on my strings? If you have rust on the plain wire, then the air around the piano is probably too humid. Don’t try to remove the rust of the piano strings; instead, have a trained piano technician clean up the rusty strings. Use a room dehumidifier to lower the humidity around the piano, or have a piano dehumidifier/humidifier system installed in the piano. How should I clean my piano keys? Use a mild detergent (like Dawn dish soap) on a damp (not soaked!) cloth to wipe off the keys. To keep the piano keys clean, always wash your hands immediately before playing. What is regulation of piano? Regulation is the adjustment of the piano action to optimize the playing ability of the piano. Have you ever sat down at a piano, and found it difficult to play? Maybe the keys felt like they weighed 10 pounds or more! A well-regulated piano will have great aftertouch and will feel great to the piano player. Regulating a piano is like tuning a car’s engine; it is the fine mechanical adjustments to the piano that improve the playing experience. A piano should be regulated after 5,000 hours of use. What does the Dampp Chaser System do? 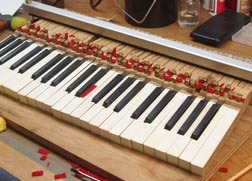 The Dampp Chaser system optimizes the humidity in the piano to stabilize the wood. Ideal humidity for a piano is 42% +/- 5%. The ASME Gauging Standard recommends a maximum humidity of 45% on metal parts at 68° F. The Dampp Chaser system is calibrated to maintain 42% humidity within the piano. Institutional pianos should be covered when not in use to help maintain proper humidity. Does the Dampp Chaser System work? Yes, as long as you keep the system plugged in and maintained! I have installed them on my two pianos at home. The Dampp Chaser will extend the life of your piano by maintaining proper humidity in the instrument. Remember, a piano is made primarily of wood, which can be damaged by significant changes in humidity. How do you know when your pedals of the piano need service? When your pedals cease to work, or they make clunking noises during play, you should have a professional service the pedals. Can I clean my own piano? Yes. If the piano has a natural wood finish, then you can use any quality furniture cleaner or polish to maintain the piano’s finish. If the piano has a highly polished black polyester finish, then you will need a special polish and cloth. If you are not sure about the finish of your piano, refer to your piano technician for help. I have an open pore (natural finish) on my grand piano and I wipe it down periodically with a damp cloth (water only). Can you repair or reproduce ornamental carvings? 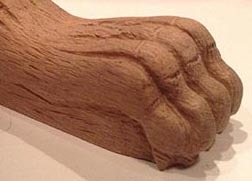 Yes, but I do my carving work in studio. I can also rebuild legs of a piano. I provide carving and turning services.